There was a time when advertising sales was easy. Woody Allen was right: 80% of success was just showing up. This environment makes it harder than ever to be able to get appointments, and it makes the few appointments we get – on the phone or in person – even more valuable. Prospective advertisers think they already know what they need to know. They have looked your company up on the Internet; perhaps they have perused your LinkedIn page or scanned your Twitter feed. How will you engage them to listen to your pitch? The answer is to ask the right power-questions. Ad-sales people know they need to ask more questions to be more engaging and more successful. Asking questions is the way to probe for objections and to uncover opportunities. But most media-sales people are afraid to ask stupid questions, so they don’t ask enough questions, then they can’t even stumble on the right ones. Asking the right questions starts with knowing as much as possible about the client. When you know a lot, you can ask power questions. Only then can a sales person exhibit enough knowledge to be taken seriously and have permission to ask even more questions to get the prospect thinking about the right things and to uncover opportunities. It is said that good lawyers never ask a question in the courtroom that they don’t know the answer to. But good ad-sales executives are unafraid to ask questions to which they don’t know the answer. First, they start with a preface about what they do know – the power in the question — and how it makes them wonder about a particular strategy or tactic of their prospect..
Masters of Media Selling is the ad-sales training course that will help any ad-sales executive increase their skills to win more and bigger accounts with power questions. 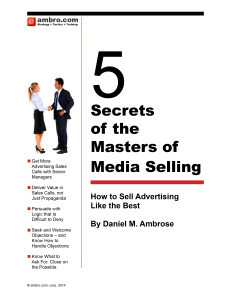 By learning the Strategic Sales Tactics developed by ambro.com, corp. founder Daniel Ambrose, media sales people will become able to get more appointments with higher level ad-buyers, able to be more persuasive in their sales calls and close more business. Contact us for a custom sales training for your sales team, or sign up here for a public course for one or more.